the methods used for the measurement and quantitative expression of color. Such methods, together with the various methods used to provide mathematical descriptions of color, constitute the subject of colorimetry. Color measurement produces three numbers, known as color coordinates, which fully define color under certain rigorously standardized conditions of examination. The basis of the mathematical description of color in colorimetry has been established experimentally: under standardized conditions, any color may be represented as a mixture, or sum, of specific quantities of three linearly independent colors (that is, colors each of which cannot be represented as the sum of any quantities of two other colors). There are an infinite number of groups, or systems, of linearly independent colors, but only certain ones are used in colorimetry. The three linearly independent colors selected are called primary colors; they determine the color coordinate system. The three numbers that describe a given color represent quantities of the primary colors in a mixture, the color of which is visually indistinguishable from the given color; they therefore constitute the color coordinates of the given color. The experimental results that provide a basis for formulating a colorimetric color coordinate system are obtained by averaging the data from observations made by a large number of observers under strictly defined conditions. They therefore do not precisely represent the properties of the color vision of any specific observer, but refer to an average, standard colorimetric observer. Since they are referred to a standard observer under specified, invariable conditions, the standard data on color mixing and the colorimetric color coordinate systems based on such mixing in fact describe only the physical aspect of color; they do not take into account changes in the color perception of the eye that result from a change in the conditions of observation and from other factors. When the color coordinates of any color are plotted with respect to three mutually perpendicular coordinate axes, the color may be geometrically represented by a point in a three-dimensional, or color, space or by a vector, the origin of which coincides with the origin of the coordinates and the end point of which coincides with the plotted color point. The two geometric interpretations of color are equivalent, and both are used in the description of colors. The points, representing all real colors, occupy a certain region in color space. However, since all points in space are equally justified, one can conditionally assume that points outside the region of real colors also represent specific colors. This broadening of the interpretation of color as a mathematical object leads to the notion of nonreal colors, which are impossible to realize in practical terms. Nevertheless, such nonreal colors can be used to carry out mathematical operations in the same manner as real colors, which proves to be extremely convenient in colorimetry. The relationships between the primary colors in a color coordinate system are selected so that the color quantities, which give a certain initial color (most often white) when mixed, are taken to be equal to unity. A specific quality of a color that does not depend on the absolute value of the color vector is called the color’s chromaticity. It is geometrically convenient to characterize chromaticity in two-dimensional space: on a unique plane in color space, passing through three unique points of the coordinate axes (the axes of the primary colors). The lines of intersection of the unique plane with the coordinate planes form an equilateral triangle on the unique plane, the vertices of which contain unique values of the primary colors. This triangle is often called a Maxwell triangle. The chromaticity of any color is determined, not by its three color coordinates, but by the ratio between them, that is, by the location in color space of a straight line passing from the origin of the coordinates through the point of the given color. In other words, chromaticity is determined only by the direction and not by the absolute value of a color vector; consequently, chromaticity may be characterized by the position of the point of intersection of this vector (or the given straight line) with the unique plane. A color triangle of more suitable shape—a right or isosceles triangle—is often used instead of a Maxwell triangle. In such cases the location of the chromaticity point in the triangle is determined by two chromaticity coordinates, each of which is equal to the ratio of one color coordinate to the sum of all three color coordinates. Two chromaticity coordinates are sufficient, since by definition the sum of the three coordinates is equal to unity. The chromaticity point of the initial (reference) color, for which the three color coordinates are equal to one another (each being equal to ⅓), is located at the centroid of the color triangle. The representation of a color by means of a color coordinate system should correspond to the properties of human color vision. Therefore, it is assumed that a physiological color coordinate system underlies all color coordinate systems. Such a system is determined by the spectral sensitivity of three different types of optical receptors (the cones) located in the retina of the human eye, which, according to the most generally accepted trichromatic theory of color vision, are responsible for human color perception. The reactions of these three receptors to radiation are regarded as color coordinates in the physiological color coordinate system, but the functions of the spectral sensitivity of the eye cannot be established by direct measurements. They are determined indirectly and are not used directly in constructing colorimetric systems. The properties of color vision are taken into account in colorimetry, based on the results of experiments with color mixing. Such experiments involve the visual matching of pure spectral colors (those corresponding to monochromatic light of various wavelengths) with mixtures of the three primary colors. Both colors are observed side by side on the two halves of the matching field of a photometric comparator. After a match is achieved, measurements are taken of the quantities of the three primary colors and the ratio of these quantities to the quantities of primary colors in the mixture (taken as equal to unity) that matches the selected reference color of white. The values obtained will be the color coordinates of the matched color in the color coordinate system, determined by the primary colors of the device and the selected reference color of white. If unit quantities of red, green, and blue primary colors are denoted by (R), (G), (B), and their quantities in the mixture (color coordinates) as R, G, B, then the result of matching may be written as the equation: C* = R(R) + G(G) + B(B). The procedure described does not permit matching of the majority of pure spectral colors with mixtures of the three primary colors of the device. In such cases a certain quantity of one of the primary colors, or even two, is added to the test color. The color of the resulting mixture is matched with a mixture of the remaining two primary colors of the device (or with one of them). In the color equation, this is taken into account by transferring the corresponding term from the left side to the right side. Thus, if red was added to the field of the color being tested, the color equation will read C* = – R(R) + G(G) + B(B). If negative values of color coordinates are allowed, all the spectral colors can be expressed by means of the selected triplet of primary colors. Averaging the results of a similar procedure for several observers yields values for the quantities of the three determined colors required in the mixtures that are visually indistinguishable from the pure spectral colors corresponding to monochromatic radiation of identical intensity. Graphic plotting of the quantities of primary colors as functions of wavelength gives the wavelength functions, called equal-energy distribution curves. Equal-energy distribution curves play a major role in colorimetry. They are used to calculate the quantities of primary colors necessary to obtain mixtures that are visually indistinguishable from the color of radiation with a complex spectral composition, that is, the color coordinates of the given color in a color coordinate system that is determined by the given equal-energy distribution curves. Here, the color of complex radiation is represented as the sum of the pure spectral colors that correspond to the complex color’s monochromatic components (with allowance made for the intensities). The possibility of a similar representation is based on one of the experimentally established laws of color mixing, according to which the color coordinates of a color in the mixture are equal to the sums of the corresponding coordinates of the colors being mixed. In this way, the equal-energy distribution curves characterize the reactions to radiation exhibited by the three different optical receptors. It is apparent that the spectral sensitivity functions of the three types of receptors in the human retina represent equal-energy distribution curves in the physiological color coordinate system. Each of the infinitely large number of possible color coordinate systems has a corresponding group of three equal-energy distribution curves, and all the groups of curves are linearly related to one another. Consequently, the curves of any one of all the possible color coordinate systems may be regarded as linear combinations of the spectral sensitivity functions of the three types of optical receptors in the human eye. The actual basis of all color coordinate systems is a system in which equal-energy distribution curves have been determined experimentally by means of the method described above. The system’s primary colors are the pure spectral colors corresponding to monochromatic radiation with wavelengths of 700.0 nanometers (nm) for red, 546.1 nm for green, and 435.8 nm for blue. The initial, or reference, chromaticity is the chromaticity of the equal-energy color white E, that is, the color of radiation with an equal distribution of intensity over the entire visible spectrum. The equal-energy distribution curves of this system, adopted by the International Commission on Illumination (CIE) in 1931, and known as the RGB system, are shown in Figure 1. The equal-energy distribution curves of the RGB system have negative sections (negative quantities of primary colors) for certain spectral colors, which is undesirable for purposes of calculation. Therefore, in addition to the RGB system, the CIE in 1931 also adopted a second color coordinate system, the XYZ system, which did not have the shortcomings of the RGB system and which offered many other possibilities for simplifying calculations. The primary colors (X), (Y), (Z) of the XYZ system are nonreal colors, selected in such a way that the equal-energy distribution curves of the system (Figure 2) have no negative sections; the coordinate Y equals the brightness of the colored object being observed, since the curve ȳ coincides with the function of the relative spectral luminous efficacy of the standard CIE observer for daylight vision. Figure 3 shows a chromaticity diagram for x, y of the XYZ system. 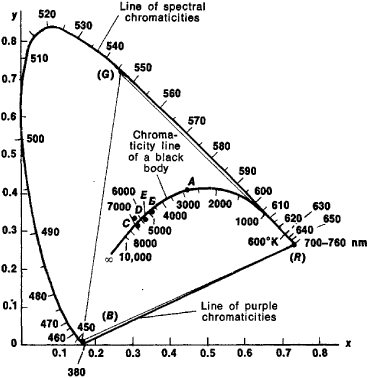 It gives the line of spectral chromaticities, the line of purple chromaticities, the color triangle (R) (G) (B) of the RGB system, the chromaticity line for the radiation of a blackbody, and the chromaticity points for the standard CIE illumination sources A, B, C, and D. The chromaticity point of the equal-energy color white E (the reference chromaticity of the XYZ system) is located at the centroid of the system’s color triangle. The system has achieved universal acceptance and is widely used in colorimetry. However, it does not correspond to the color-discriminating properties of the eye; that is, identical distances on the chromaticity (x, y) diagram in different sections do not correspond to an identical visual difference between the corresponding colors at identical brightness (see). where W = 25Y⅓ – 17, U = 13W (u – u0), and V = 13W (v – v0). Here v0, v0 represents the chromaticity of the reference color white, and Y is the reflection coefficient, in percent, at a given point on the object. The above description demonstrates that the purpose of the color measurement process is to determine the color coordinates of a color in a certain color coordinate system. In most cases, this is the standard XYZ colorimetric system of the CIE. When a color (always understood in objective color measurements as the color of a colored object or of a light source) is represented by the spectral distribution of radiation emitted by a source or reflected or transmitted by an object, then the determination of the color coordinates calls for the use of equal-energy distribution curves as weighting functions that evaluate such radiation. Such an evaluation can be carried out in two ways. 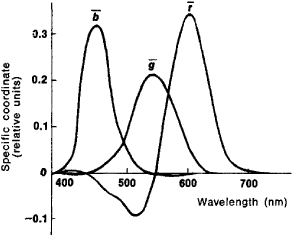 The spectral distribution of radiation and the spectral reflection or transmission coefficient are measured by breaking up the light into a spectrum, for example, in a spectrophotometer or mono-chromator. The equal-energy distribution curves are given as tables of values for specific coordinates over 5 or 10 nm. There are also tables of the values E(λ), x̄(λ), and so forth for the standard CIE light sources A, B, C, and D, which represent the most typical conditions of natural (B, C, D) and artificial (A) illumination. A second method of color measurement based on equal-energy distribution curves is the analysis of radiation by means of three optical detectors with spectral sensitivity characteristics that coincide with the equal-energy distribution curves. Each photoelectric transducer of this type multiplies the two spectral functions and integrates the products, as a result of which the electric signal at the transducer output is equal to one of the color coordinates (provided the device has been suitably calibrated). Similar color measurement devices are called photoelectric, or objective, colorimeters. They evaluate the resultant radiation, taking into account the selective reflection or transmission of the nonluminous objects and the illumination, that is, the device “sees” what the eye sees. The primary difficulty in manufacturing photoelectric colorimeters is the precision required for shaping the equal-energy distribution curves, for which corresponding light filters are usually selected. If the device is designed for operation with the equal-energy distribution curves x̄, ȳ, z̄, then the greatest difficulty is encountered when shaping the curve x̄ (Figure 2), which has two maxima. Usually each one of its branches is formed individually, and the device then contains four channels (light filters). Colorimeters sometimes use other color coordinate systems in which all the equal-energy distribution curves have a single maximum. 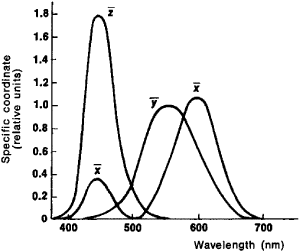 One of the channels in a colorimeter can simultaneously function as a luminance photometer. In such devices provision is often made for the calculation of chromaticity coordinates. The maximum accuracy of color measurements made by photoelectric colorimeters for chromaticity in the coordinates x, y varies from 0.002 to 0.005. Another important possibility of color measurements is the direct determination of color coordinates. Of course this is not always possible, since, in the general case, color perception is stimulated by light radiation of arbitrary spectral composition and no color coordinates physically exist. The direct measurement of color coordinates is possible in trichromatic, additive light-generating devices, which are used, for example, in the reproduction of color images. The primary colors of such a device determine the color coordinate system as well as the quantities that, in a mixture, will produce a certain color; the color coordinates of a given color exist in the color coordinate system of the device. The calibration of a similar device consists in recording the readings during successive measurements of the intensity of luminescence of the three phosphors after fixing the reference color white on the screen, that is, the color with the reference chromaticity of the color coordinate system of the kinescope and maximum brightness. Subsequently, during measurements of different colors, the instrument readings are divided into readings of the corresponding primary colors for the reference color white. The results of the division will be the color coordinates in the color coordinate system of the kinescope. During calibration, the reference color white is established as accurately as possible by means of other devices, such as a spectrophotometer or photoelectric colorimeter, or it may be established visually according to a special standard test strip for the color white. The accuracy with which the reference color white is fixed during calibration determines the accuracy of subsequent color measurements. It is possible to obtain values for color coordinates in other color coordinate systems (for example, international systems) by recalculating the instrument readings according to the conversion formulas for color coordinates. The derivation of recalculation formulas calls for knowledge of the chromaticity coordinates of the reference color white and the primary colors of a given kinescope, which must be measured by some other method. obtain the values of color coordinates over three readings taken by the three-filter instrument. Calibration consists of each channel’s successive measurement of the individual color luminescence of the phosphors after the reference color white has been fixed on the screen. The indicated recalculation, as well as the change from the color coordinates in the color coordinate system of the kinescope to coordinates in an international color coordinate system, may be done automatically by means of a specially built-in electric circuit. In this way one can obtain readings directly in the color coordinate system of the kinescope or in an international color coordinate system. Color coordinates are also determined during color measurements with a visual colorimeter. By adjusting the quantities of the three primary colors in the instrument, the observer visually matches the color of the mixture of the primary colors and that of the color being tested. The color of the mixture is then measured. The mixture’s color coordinates are the quantities of the primary colors in the colorimeter referred to the quantities of the same colors included in the mixture, which gives the reference color white in the color coordinate system of the colorimeter. It is even easier to measure the quantities of primary colors in a visual colorimeter than in a color kinescope. It is sufficient to read the indications on three scales that are graduated according to the apertures of the slits that transmit the luminous flux of the corresponding colors to the matching field. Thus, when visual colorimeters are used, one directly measures, not the color of the specimen, but the color’s metamer—the color of the mixture of the colorimeter’s three primary colors. The visual matching of the two colors is used to obtain a metamer of the color of the specimen, so that the color coordinates can be easily measured. An advantage of visual colorimetry is the high accuracy of the color measurement; a disadvantage is that the results obtained are referred to a specific observer (that is, the one who visually matches the two colors) and not to a standard observer. More-over, it is difficult to measure the color of objects (as opposed to individual specimens) when using this method. Color atlases also use visual comparisons of a color with another color of known color coordinates (or coordinates that can be easily measured). Color atlases consist of sets of color samples in the form of colored slips of paper systematically arranged in a specific order. The color being measured is compared with the atlas samples, and the sample that most closely matches the test color is selected. The test color is named after the sample according to the notation adopted for the given atlas. In order that the test color may be described in the international color coordinate system, all the samples in the atlas have been previously measured in the system under specified illumination, and it is desirable to observe the test colors under the same illumination. Color atlases make it possible to measure the color of objects, not just individual specimens; however, the discrete nature of the selection of colors in the atlas reduces measurement accuracy, which is further reduced because the conditions of visual comparison are worse here than in visual colorimetry. The Rabkin and VNIIM (D. I. Mendeleev All-Union Research Institute of Metrology) color atlases are used in the USSR; measurements based on the Munsell color atlas are widely used in the USA. Color measurements from color atlases are approximate and can be successfully carried out in cases that do not require extreme accuracy or where other methods are not suitable. The expression of a color in a specific color coordinate system, that is, through assignment of color coordinates or brightness and chromaticity coordinates, is the method most commonly used throughout the world. However, other methods for the qualitative expression of color also exist, for example, by means of color atlases. Still another method is the expression of color by specification of the luminance, dominant wavelength, and purity of the color; the last two parameters characterize chromaticity. One advantage of such a method lies in the close correspondence of the three given color parameters to the color’s subjective characteristics—brightness, hue, and saturation. It would be very convenient to characterize chromaticity by one number; however, the two-dimensional nature of the parameter usually requires that it be expressed by two numbers. A one-dimensional expression can only be used for certain groups of chromaticities, such as certain lines on the chromaticity diagram. The first such group includes pure spectral colors and pure purple colors, the chromaticity of which is determined by the values of the dominant wavelengths. A second group for which a one-dimensional expression is possible includes the chromaticities of the radiation of a blackbody, which are used to characterize the illumination sources with luminescence chromaticities close to the chromaticity of the color white. The quantity that determines the location of a point on the chromaticity line for idealized blackbody radiation (and the chromaticity of the sources indicated) is called the color temperature, that is, the temperature in degrees Kelvin of a blackbody at which the given chromaticity is exhibited. Gurevich, M. M. Tsvet i ego izmerenie. Moscow-Leningrad, 1950. Krivoshev, M. I., and A. K. Kustarev. Svetovye izmereniia v televidenii. Moscow, 1973. Niuberg, N. D. Izmerenie tsveta i tsvetovye standarty. Moscow, 1933. Wright, W. D. The Measurement of Colour, 3rd ed. London, 1964. Wyszecki, G., and W. S. Stiles. Color Science. New York, 1967. Using a 31-bin spectrophotometer, Color Measurement with DeltaCam offers full spectral measurement for CI flexo, inline flexo and gravure presses. This well-attended seminar focused on how integrated end-to-end color measurement and management solutions from X-Rite Pantone and its partners can make a difference in a wide variety of industrial applications, ranging from paint and coatings to textiles, plastics, food, construction chemicals and more, delivering improved quality, productivity and profitability while reducing waste and improving time to market. This new instrument, designed especially for paint retailers and hardware stores, contains color measurement technology in a compact form factor. The instrument reportedly delivers industry-leading color measurement performance while offering correlation to Datacolor's 600 series of benchtop instruments. The authors approach color measurement as more than engineering and instrumentation, but also include physiological and psychological perspectives of the human observer. Jotun Paints, one of the world's leading producers of paints and coatings, has introduced a new color measurement service in Saudi Arabia. to expand technical and client support capabilities for its new KeyColor color measurement product line. The International Commission on Illumination (abbreviated "CIE" after the original French name of the commission) has set color measurement (colorimetric) standards since 1931. UltraScan VIS, a high performance color measurement spectrophotometer, has been designed by HunterLab. Until now, non-contact color measurement has been served on the low end by inexpensive colorimeters capable of distinguishing only gross color differences. The announcement last month of X-Rite's purchase of GretagMacbeth AG brings the number 1 and number 2 players in the color measurement instrumentation market together, creating a dominant company in the market. released a new standard for color measurement on Jan.
Color Me Mine Enterprises, Inc.